The Bald Eagle (Haliaeetus leucocephalus Greek hali = salt, aeetus = eagle, leuco = white, cephalis = head) is a bird of prey found in North America. It is the national bird and symbol of the United States of America. This sea eagle has two known sub-species and forms a species pair with the White-tailed Eagle. Its range includes most of Canada and Alaska, all of the contiguous United States, and northern Mexico. It is found near large bodies of open water with an abundant food supply and old-growth trees for nesting. The adult Bald Eagle is mainly brown with a white head and tail. The sexes are identical in plumage, but females are larger than males. The beak is large and hooked. The plumage of the immature is brown. Bald Eagles are not actually bald, the name derives from the older meaning of the word, "white headed". In the late 20th century the Bald Eagle was on the brink of extirpation in the continental United States, while flourishing in much of Alaska and Canada. Populations recovered and stabilized, so the species was removed from the U.S. federal government's list of endangered species and transferred to the list of threatened species on July 12, 1995, and it was removed from the List of Endangered and Threatened Wildlife in the Lower 48 States on June 28, 2007. The plumage of an adult Bald Eagle is evenly brown with a white head and tail. The tail is moderately long and slightly wedge-shaped. Males and females are identical in plumage coloration, but sexual dimorphism is evident in the species in that females are 25 percent larger than males. The beak, feet and irides are bright yellow. The legs are feather-free, and the toes are short and powerful with large talons. The highly developed talon of the hind toe is used to pierce the vital areas of prey while it is held immobile by the front toes. The beak is large and hooked, with a yellow cere. The plumage of the immature is brown, speckled with white until the fifth (rarely fourth, very rarely third) year, when it reaches sexual maturity. Immature Bald Eagles are distinguishable from the Golden Eagle in that the former has a more protruding head with a larger beak, straighter edged wings which are held flat (not slightly raised) and with a stiffer wing beat, and feathers which do not completely cover the legs. The Bald Eagle has sometimes been considered the largest true raptor in North America (excluding the possibly unrelated California Condor), although the species overlaps in size with the American races of the Golden Eagle. It is certainly a large bird, with a body length of 70–102 centimeters (28–40 in). The wingspan is typically between 1.8 and 2.3 m (5.9 and 7.5 ft) and mass is usually between 2.5 and 7 kilograms (5.5 and 15 lb). Females are about 25 percent larger than males, averaging 5.8 kg (13 lb) and against the males' average weight of 4.1 kg (9.0 lb). The size of the bird varies by location; the smallest specimens are those from Florida, where mature males may weigh as little as 2.3 kg (5.1 lb) and have a wingspan of 1.68 m (5.5 ft). The largest eagles are from Alaska, where large females may weigh up to 7.5 kg (17 lb) and span 2.44 m (8.0 ft) across the wings. Its diet consists mainly of fish, but it is an opportunistic feeder. It hunts fish by swooping down and snatching the fish out of the water with its talons. It is sexually mature at four years or five years of age. The Bald Eagle builds the largest nest of any North American bird, up to 4 meters (13 ft) deep, 2.5 meters (8.2 ft) wide, and one metric ton (1.1 tons) in weight. A species placed in the genus Haliaeetus (sea eagles) which gets both its common and scientific names from the distinctive appearance of the adult's head. Bald in the English name is derived from the word piebald, and refers to the white head and tail feathers and their contrast with the darker body. The scientific name is derived from Haliaeetus, New Latin for "sea eagle" (from the Ancient Greek haliaetos), and leucocephalus, Latinized Ancient Greek for "white head," from λευκος leukos ("white") and κεφαλη kephale ("head"). H. l. leucocephalus (Linnaeus, 1766) is the nominate subspecies. It is separated from H. l. washingtoniensis at approximately latitude 38° N, or roughly the latitude of San Francisco. It is found in the southern United States and Baja California. H. l. washingtoniensis (Audubon, 1827), synonym H. l. alascanus Townsend, 1897, the northern subspecies, is larger than southern nominate leucocephalus. It is found in the northern United States, Canada and Alaska. This subspecies reaches further south than latitude 38° N on the Atlantic Coast, where they occur in the Cape Hatteras area. The Bald Eagle forms a species pair with the Eurasian White-tailed Eagle. This species pair consists of a white-headed and a tan-headed species of roughly equal size; the White-tailed Eagle also has overall somewhat paler brown body plumage. The pair diverged from other Sea Eagles at the beginning of the Early Miocene (c. 10 Ma BP) at the latest, but possibly as early as the Early/Middle Oligocene, 28 Ma BP, if the most ancient fossil record is correctly assigned to this genus. The two species probably diverged in the North Pacific, as the White-tailed Eagle spread westwards into Eurasia and the Bald Eagle spread eastwards into North America. The Bald Eagle prefers habitats near seacoasts, rivers, large lakes, oceans, and other large bodies of open water with an abundance of fish. Studies have shown a preference for bodies of water with a circumference greater than 11 km (7 mi), and lakes with an area greater than 10 square kilometers (4 sq mi) are optimal for breeding Bald Eagles. The Bald Eagle requires old-growth and mature stands of coniferous or hardwood trees for perching, roosting, and nesting. Selected trees must have good visibility, an open structure, and proximity to prey, but the height or species of tree is not as important as an abundance of comparatively large trees surrounding the body of water. Forests used for nesting should have a canopy cover of no more than 60 percent, and no less than 20 percent, and be in close proximity to water. The Bald Eagle is extremely sensitive to human activity, and is found most commonly in areas free of human disturbance. It chooses sites more than 1.2 km (0.75 mi) from low-density human disturbance and more than 1.8 km (1.1 mi) from medium- to high-density human disturbance. Occasionally Bald Eagles will venture into large estuaries or secluded groves within major cities, such as Hardtack Island on the Willamette River in Portland, Oregon. Despite this sensitivity, a family of Bald Eagles recently moved to the Harlem neighborhood of Manhattan in New York City. 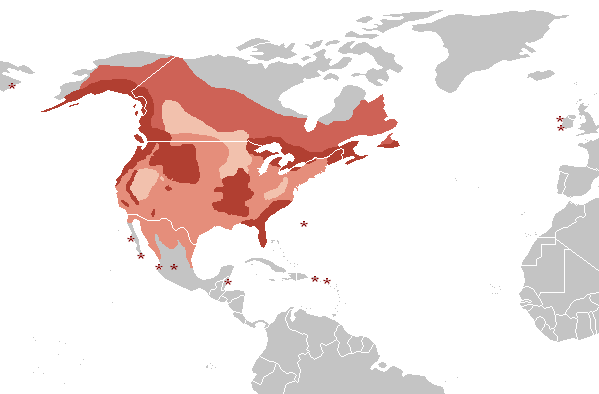 The Bald Eagle's natural range covers most of North America, including most of Canada, all of the continental United States, and northern Mexico. It is the only sea eagle endemic to North America. Occupying varied habitats from the bayous of Louisiana to the Sonoran Desert and the eastern deciduous forests of Quebec and New England, northern birds are migratory, while southern birds are resident, remaining on their breeding territory all year. At minimum population, in the 1950s, it was largely restricted to Alaska, the Aleutian Islands, northern and eastern Canada, and Florida. Bald Eagles will also congregate in certain locations in winter. From November until February, one to two thousand birds winter in Squamish, British Columbia, about halfway between Vancouver and Whistler. The birds primarily gather along the Squamish and Cheakamus Rivers, attracted by the salmon spawning in the area. The Bald Eagle is a powerful flier, and soars on thermal convection currents. It reaches speeds of 56–70 kilometers per hour (35–43 mph) when gliding and flapping, and about 48 kilometers per hour (30 mph) while carrying fish. Its dive speed is between 120–160 kilometers per hour (75–99 mph), though it seldom dives vertically. It is partially migratory, depending on location. If its territory has access to open water, it remains there year-round, but if the body of water freezes during the winter, making it impossible to obtain food, it migrates to the south or to the coast. The Bald Eagle selects migration routes which take advantage of thermals, updrafts, and food resources. During migration, it may ascend in a thermal and then glide down, or may ascend in updrafts created by the wind against a cliff or other terrain. Migration generally takes place during the daytime, when thermals are produced by the sun. The Bald Eagle's diet is opportunistic and varied, but most feed mainly on fish. In the Pacific Northwest, spawning trout and salmon provide most of the Bald Eagles' diet. Locally, eagles may rely largely on carrion, especially in winter, and they will scavenge carcasses up to the size of whales, though it seems that carcasses of ungulates and large fish are preferred. They also may sometimes feed on subsistence scavenged or stolen from campsites and picnics, as well as garbage dumps. Mammalian prey includes rabbits, hares, raccoons, muskrats, beavers, and deer fawns. Preferred avian prey includes grebes, alcids, ducks, gulls, coots, egrets, and geese. Most live prey are quite a bit smaller than the eagle, but predatory attacks on larger birds such as swans have been recorded. 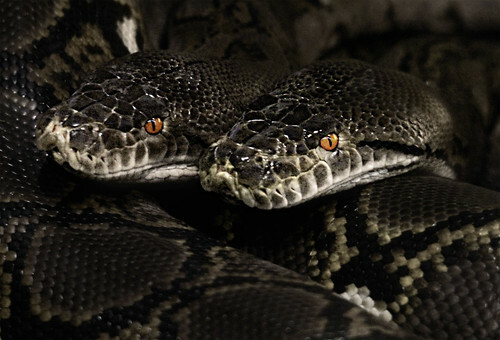 Reptiles, amphibians and crustaceans (especially crabs) are preyed on when available. To hunt fish, easily their most important live prey, the eagle swoops down over the water and snatches the fish out of the water with its talons. They eat by holding the fish in one claw and tearing the flesh with the other. Eagles have structures on their toes called spicules that allow them to grasp fish. Osprey also have this adaptation. Bald Eagles have powerful talons and have been recorded flying with a 15-pound Mule Deer fawn. It has been estimated that the gripping power (pounds by square inch) of the bald eagle is ten times greater than that of a human. Sometimes, if the fish is too heavy to lift, the eagle will be dragged into the water. It may swim to safety, but some eagles drown or succumb to hypothermia. When competing for food, eagles will usually dominate other fish-eaters and scavengers, aggressively displacing mammals such as coyotes and foxes, and birds such as corvids, gulls, vultures and other raptors. Bald Eagles may be displaced by themselves or by Golden Eagles. Neither species is known to be dominant, and the outcome depends on the individual animal. Occasionally, Bald Eagles will steal fish and other prey away from smaller raptors, such as Ospreys, a practice known as kleptoparasitism. Healthy adult Bald Eagles are not preyed on in the wild and are thus considered apex predators. In one case, an adult eagle investigating a Peregrine Falcon nest for prey items sustained a concussion from a swooping parent Peregrine, and ultimately died days later from it. Bald Eagles are sexually mature at four or five years of age. When they are old enough to breed, they often return to the area where they were born. It is thought that Bald Eagles mate for life. However, if one member of a pair dies or disappears, the other will choose a new mate. A pair which has repeatedly failed in breeding attempts may split and look for new mates. Bald Eagle courtship involves elaborate calls and flight displays. The flight includes swoops, chases, and cartwheels, in which they fly high, lock talons, and free fall, separating just before hitting the ground. The nest is the largest of any bird in North America; it is used repeatedly over many years and with new material added each year may eventually be as large as 4 meters (13 ft) deep, 2.5 meters (8.2 ft) across and weigh 1 metric ton (1.1 short tons); one nest in Florida was found to be 6.1 meters (20 ft) deep, 2.9 meters (9.5 ft) across, and to weigh 3 short tons (2.7 t). This nest is on record as the largest tree nest ever known. The nest is built out of branches, usually in large trees near water. When breeding where there are no trees, the Bald Eagle will nest on the ground. Eagles produce between one and three eggs per year, but it is rare for all three chicks to successfully fly. Both the male and female take turns incubating the eggs. The other parent will hunt for food or look for nesting material. The eggs average about 73 millimeters (2.9 in) long and have a breadth of 55 millimeters (2.2 in). Once a common sight in much of the continent, the Bald Eagle was severely affected in the mid-20th century by a variety of factors, among them the thinning of egg shells attributed to use of the pesticide DDT. Bald Eagles, like many birds of prey, were especially affected by DDT due to biomagnification. DDT itself was not lethal to the adult bird, but it interfered with the bird's calcium metabolism, making the bird either sterile or unable to lay healthy eggs. Female eagles laid eggs that were too brittle to withstand the weight of a brooding adult, making it nearly impossible for the eggs to hatch. It is estimated that in the early 18th century, the Bald Eagle population was 300,000–500,000, but by the 1950s there were only 412 nesting pairs in the 48 contiguous states of the US. Other factors in Bald Eagle population reductions were a widespread loss of suitable habitat, as well as both legal and illegal shooting. In 1930 a New York City ornithologist wrote that in the state of Alaska in the last 12 years approximately 70,000 Bald Eagles had been shot. Many of the hunters killed the Bald Eagles under the long held mistaken beliefs that Bald Eagles grabbed young lambs and even children with their talons. Later illegal shooting was described as "the leading cause of direct mortality in both adult and immature bald eagles," according to a 1978 report in the Endangered Species Technical Bulletin. In 1984, the National Wildlife Federation listed hunting, power-line electrocution, and collisions in flight as the leading causes of eagle deaths. Bald Eagle populations have also been negatively affected by oil, lead, and mercury pollution, and by human and predator intrusion. The species was first protected in the U.S. and Canada by the 1918 Migratory Bird Treaty, later extended to all of North America. The 1940 Bald Eagle Protection Act in the U.S., which protected the Bald Eagle and the Golden Eagle, prohibited commercial trapping and killing of the birds. The Bald Eagle was declared an endangered species in the U.S. in 1967, and amendments to the 1940 act between 1962 and 1972 further restricted commercial uses and increased penalties for violators. Also in 1972, DDT was banned in the United States. DDT was completely banned in Canada in 1989, though its use had been highly restricted since the late 1970s. With regulations in place and DDT banned, the eagle population rebounded. The Bald Eagle can be found in growing concentrations throughout the United States and Canada, particularly near large bodies of water. In the early 1980s, the estimated total population was 100,000 individuals, with 110,000–115,000 by 1992; the U.S. state with the largest resident population is Alaska, with about 40,000–50,000, with the next highest population the Canadian province of British Columbia with 20,000–30,000 in 1992. 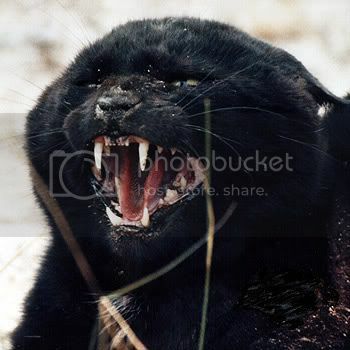 It was officially removed from the U.S. federal government's list of endangered species on July 12, 1995, by the U.S. Fish & Wildlife Service, when it was reclassified from "Endangered" to "Threatened." On July 6, 1999, a proposal was initiated "To Remove the Bald Eagle in the Lower 48 States From the List of Endangered and Threatened Wildlife." It was de-listed on June 28, 2007. It has also been assigned a risk level of Least Concern category on the IUCN Red List. The Bald Eagle is important in various Native American cultures, and as the national bird of the United States, is prominent in seals and logos, coinage, postage stamps, and other items relating to the U.S. federal government. Current eagle feather law stipulates that only individuals of certifiable Native American ancestry enrolled in a federally recognized tribe are legally authorized to obtain Bald or Golden Eagle feathers for religious or spiritual use. The constitutionality of these laws has been questioned by Native American groups on the basis that it violates the First Amendment by affecting ability to practice their religion freely. The Bald Eagle is the national bird of the United States of America. The founders of the United States were fond of comparing their new republic with the Roman Republic, in which eagle imagery was prominent. On June 20, 1782, the Continental Congress adopted the still-current design for the Great Seal of the United States including a Bald Eagle grasping 13 arrows and a 13-leaf olive branch with its talons. The Bald Eagle appears on most official seals of the U.S. government, including the Seal of the President of the United States and the Presidential Flag, and in many U.S. federal agency logos. Between 1916 and 1945, the Presidential Flag showed an eagle facing to its left (the viewer's right), which gave rise to the urban legend that the seal is changed to have the eagle face towards the olive branch in peace, and towards the arrows in wartime. Contrary to popular legend, there is no evidence that Benjamin Franklin ever supported the Wild Turkey, rather than the Bald Eagle, as a symbol of the United States. The origin of this claim is a letter Franklin wrote to his daughter in 1784 from Paris. However, this letter was a criticism of the Society of the Cincinnati, and does not mention the choice of the Bald Eagle for the Great Seal of the United States. Franklin opposed the creation of the Society because he viewed it, with its hereditary membership, as a noble order unwelcome in the newly independent Republic, contrary to the ideals of Lucius Quinctius Cincinnatus, for whom the Society was named; his reference to the two kinds of birds is interpreted as a satirical comparison between the Society of the Cincinnati and Cincinnatus. 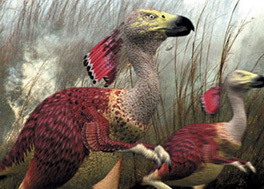 "The Great Terror Birds of Patagonia died off long ago. Now, a new type of bird that shall strike fear into the hearts of many has risen from the ashes!" I saw three of these guys on my way home from work today. Population is going strong in Missouri! I can't wait till the Mississippi freezes over! that's always a site to see, hundreds of eagles congregating on the ice.